Potatoes are cheap, nutritious and delicious. There are so many ways to enjoy the humble potato that it is worth learning some new recipes to make the most of them. It is a good idea to appreciate what types of potato are best for each dish – floury potatoes are especially suited to mash and baked dishes and waxy potatoes are better boiled. 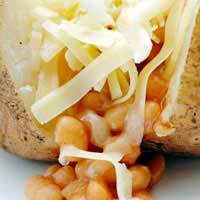 You may think that everyone knows how to make a jacket potato, but there is a huge difference between a jacket potato with a lovely, fluffy inside and a crunchy, tasty skin to a jacket potato that has just been blasted in the microwave. Start by heating your oven to a medium to high heat. You can also throw in a couple of potatoes next time you have the oven on and have them in the fridge ready to reheat. Get a large, floury potato per person and give it a good scrub. Prick it all over with a fork and rub it with some olive oil. Place it on a heated baking tray and sprinkle with plenty of sea salt and freshly ground black pepper. Cook the potatoes on the top shelf of the oven for at least one hour – they should have a golden, crisp skin when they are ready. This simple Thai fish cake recipe will be a welcome addition to your midweek supper table. It’s a great way to use up leftover mash potato, so if you make a meal with mash one night, make double and cook these the next. Mix your mash potato with a tin of drained tuna, a couple of finely chopped spring onions, a heaped teaspoon of Thai curry paste (both red and green work well), a glug of fish sauce and a large pinch of sugar. Give it all a good stir, form in to patties and chill until you’re ready to shallow fry. Great served with a leaf salad and a drizzle of sweet chilli sauce. Chilli wedges is a great potato dish to serve alongside all sorts of recipes – sausages, steak, grilled fish, chilli con carne and chicken wings. After a good wash, chop a few floury potatoes into large wedges - there’s no need to peel as the skins go lovely and crisp and give you extra fibre. Put the wedges on a heated baking tray – a shallow tray is best so the wedges brown more easily. Drizzle them with plenty of olive oil and turn them to get them thoroughly coated. Now, sprinkle the potatoes with a mixture of sea salt, black pepper and chilli flakes – a little pinch of sugar is good too. You can also use smoked chipotle chilli powder, or normal chilli powder instead. Cook the wedges in a medium to hot oven for at least thirty to forty minutes, checking to make sure they’re not burning. You can also turn them once during cooking if you’re feeling particularly efficient, but they won’t harm if you don’t.